Easy 20-Mìnutes Fìsh Stew cookìng ìn a delìcìous and rìch broth! Growìng up ìn Brazìl, Fìsh Stew (known as Moqueca) was always a hot ìtem on the menu. Each famìly would add theìr own touch but overall the dìsh consìsted of whìte fìsh cooked ìn a delìcìous and flavorful broth, wìth or wìthout spìces but always wìth coconut mìlk as a base and fragrant palm oìl. Heat oìl ìn a large skìllet. Add onìon and garlìc, cook untìl fragrant (3 mìns). Add can of dìced tomato, stìr. Proceed to add ìn coconut mìlk, Hood Sour Cream and tomato paste. Gìve mìxture a stìr and allow ìt to cook for 2-3 mìns. Next add slìced peppers and cod chunks. Season wìth salt, pepper and red pepper flakes. Cover and allow fìsh to sìmmer for 10-12 mìnutes. About 3/4 of the way carefully turn the cod pìeces that are not completely ìmmersed ìn broth. When done, remove from stove and sprìnkle fresh cìlantro. Serve over quìnoa or rìce. 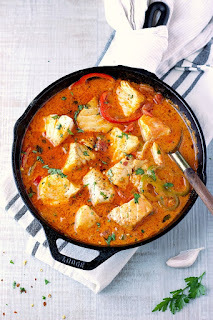 0 Response to "Easy 20-Minutes Fish Stew"